Save money and time with the Online Kansas LLC formation application. Our easy-to-use service helps you form your LLC directly online without the costly attorney fees. Pick a package, complete a comprehensive interview online, follow our step-by-step instructions, and leave the rest to us. We file your articles of organization with the Kansas Secretary of State for you and your LLC will come into existence the day they're filed. If you'd like to form an LLC in a state other than Kansas, click here to select your state. 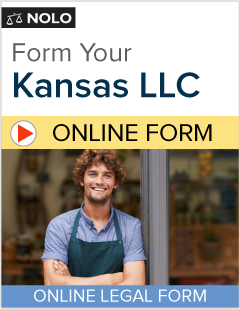 Form your Kansas LLC today! How do I form a Kansas LLC? How much will it cost to form my Kansas LLC? How long will it take to form my Kansas LLC? Will I have to pay taxes on my Kansas LLC? Do I need a lawyer to form an LLC in Kansas? How many people do I need to form a Kansas LLC? You can form a Kansas LLC with just one owner. Note that Nolo's Online Kansas LLC does not allow you to form a series LLC, a restricted LLC, a nonprofit LLC, or a professional LLC. In Kansas, you create an LLC by filing "articles of organization" with the Secretary of State and paying a filing fee. You'll also need an LLC operating agreement, though it doesn't need to be filed with the Secretary of State. Your operating agreement explicitly states the rights and responsibilities of the LLC owners (and managers, if applicable). An operating agreement clarifies the business arrangement between the owners and governs how your LLC will be run. If you don't create a written operating agreement, the LLC laws of your state will govern the inner workings of your LLC. To begin creating your Kansas LLC, visit the Online Kansas LLC page at the Nolo website. The price of Nolo's Online Kansas LLC formation service varies depending on your needs. Nolo's Basic Service. The price starts as low as $99.00 for Nolo's Basic Service, which includes preparation of the articles of organization, preparation of a customized operating agreement, and standard filing, which will take up to two weeks. Nolo's Express Premiere Service. For all of these items plus Priority Rush Filing, a personalized LLC records book, membership certificates, an LLC seal, and preparation of the IRS application for a tax ID (Form SS-4), choose Nolo's Express Premiere Service for $299.00. With Priority Rush Filing, Nolo will submit your articles of organization to the Secretary of State within one business day and you'll receive your final LLC documents two business days later. Note that the filing fee charged by the state is not included in our package prices. The Secretary of State charges $160.00 for filing articles of organization online. This fee will be added to your total when you check out. Note also that you will need to file an annual report with the Secretary of State each year. For most LLCs, the report is due April 15, but only after your LLC has been in existence six months. There is a $50 fee for filing this report, which you can file online here. To compare Nolo's Kansas LLC packages, see the package and pricing details. If you order the Basic package, we will file your paperwork with the Kansas Secretary of State within four to five business days and you'll receive your completed LLC package two business days later. If you order the Express Premiere package, we will file your paperwork with the Kansas Secretary of State within one business day. You will receive your completed LLC documents by email one business day later. You'll receive your LLC records kit directly from the manufacturer. State taxes. Your LLC may need to register with the Kansas Department of Revenue. You can go to the Kansas Department of Revenue's website at www.ksrevenue.org/business.html to register. You may also find it helpful to read Nolo's article on Kansas LLC Annual Filing Requirements. You can form your own LLC online by using Nolo's Online Kansas LLC. We will walk you through the information we need to form your limited liability company. If you have a complex question, you may want to consult a business lawyer or tax expert. Our website features an online lawyer directory as a free resource to our customers. Comprehensive profiles of business attorneys in your state can be found at www.nolo.com. You can form an LLC in Kansas even if your business will not be located in Kansas and/or no LLC members will live there. But you will probably still need to qualify your LLC to do business in your home state—and this means you'll have to file additional paperwork and pay additional fees. For more information on whether you'll need to qualify to do business in certain states, read Nolo's article Qualifying to Do Business Outside Your State on Nolo's website. Note that if you don't register to do business in another state when required, you won't be able to enforce contracts in that state. Like a corporation, an LLC is meant to be a permanent legal entity, and it will exist—and incur taxes and fees, whether or not you are actively operating a business—until you take legal steps to dissolve it. If you decide to discontinue business as an LLC, you must file cancellation, withdrawal, or dissolution paperwork with the Secretary of State. To file online, see the Secretary of State's website at www.kansas.gov/dissolutions/index.do. For general information on closing a business, read the article Closing Your Business: What You Need to Do on Nolo's website. After completing your purchase, you may no longer go back and change your answers because your order is being processed. You may, however, view your answers by signing in to your Nolo account at www.nolo.com/products/customer/account/login, clicking on My Account, and clicking on Kansas LLC.